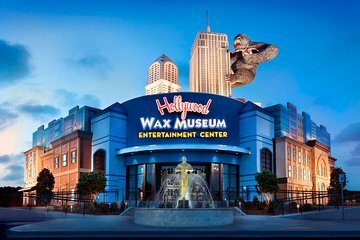 Admission to the Myrtle Beach Hollywood Wax Museum gets you access two storeys of star-studded exhibits. Don’t forget your camera—this is the perfect time to pose next to today’s pop stars and nostalgic pop culture icons. Meet Myrtle Beach’s 35,000 lb. Great Ape, then trace a route through a who’s-who of movie heroes and villains. Challenge yourself to celebrity trivia and learn fun facts along the way. Strike your best ‘Iron Man’ pose alongside Robert Downey, Jr., then practice lines from ‘Goodfellas’ with tough guy Robert DeNiro. Flash a 1,000-watt smile next to Julia Roberts, give a royal wave to Princess Di and sail the high seas with Captain Jack Sparrow. Sit down for breakfast with a young Audrey Hepburn before sharing a box of chocolates with Forrest Gump. You’ll find a fun collection of props along the way, so you can make your photos as lifelike and realistic as the wax figures themselves. Terrific wax museum. Really enjoyed it especially this time of year when it's not very busy. We took our time and took a lot of pictures.